I was not sure where to put this. Ok, I just got my hands on a Christensen Arms Ridgeline 30 Nosler. I crunched a lot of numbers over and over. With the boattail junction seated at the neck shoulder junction a 215 Berger is .020 off the lands in this chamber(SAAMI). If I were to order a custom reamer I would go .020 more but I think the SAAMI will be ok. I plan on working up a load and seeing how it compares. My comparison will not be apples to apples. My 300 win has a 28" nitrided barrel. Sweet! I figured you would have to throats them longer to be ideal. 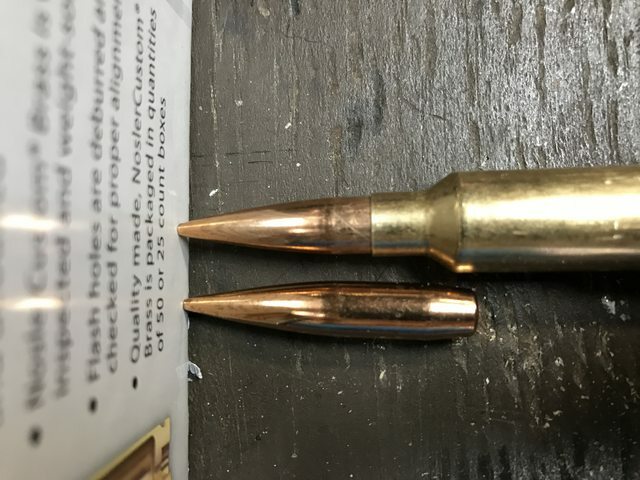 Really like the idea of a 30 nosler for future build but I'm already set up with 300 Norma..
Guys, we are in deep stages of figuring what the 30 Nos likes for accuracy and performance. We may need to do some reamer spec changes to get top performance. I would hold off on things a few days till we finish. We have test data from 3 actions, 3 barrels and two reamers. Results will be updated soon in the "Executive Order" thread on LRO. If you are ordering a reamer I would absolutely wait for Jeff's report back. I was simply giving some data to someone who may be on the fence with a SAAMI chambered rifle such as the Ridgeline. When I ordered the rifle I was concerned there would be too little room for the 215 Berger. I should have been more clear in my post. Thanks Jeff. Not at all , you were fine. I just wanted to reach out because I feel we may be seeing a pattern worth following as soon as we document repeated results. I can't wait to see/hear the results. My Ridgeline is currently curing in a Stocky's long range carbon stock. I hope to start load development this weekend. I think I will start with Retumbo.